Gymnastics Zone: Let’s Get Ready to Tumble! 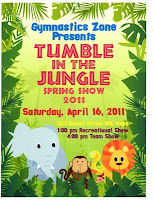 Watch out for wild animals when the gymnasts at the Gymnastics Zone present their annual spring show on Saturday, April 16th. 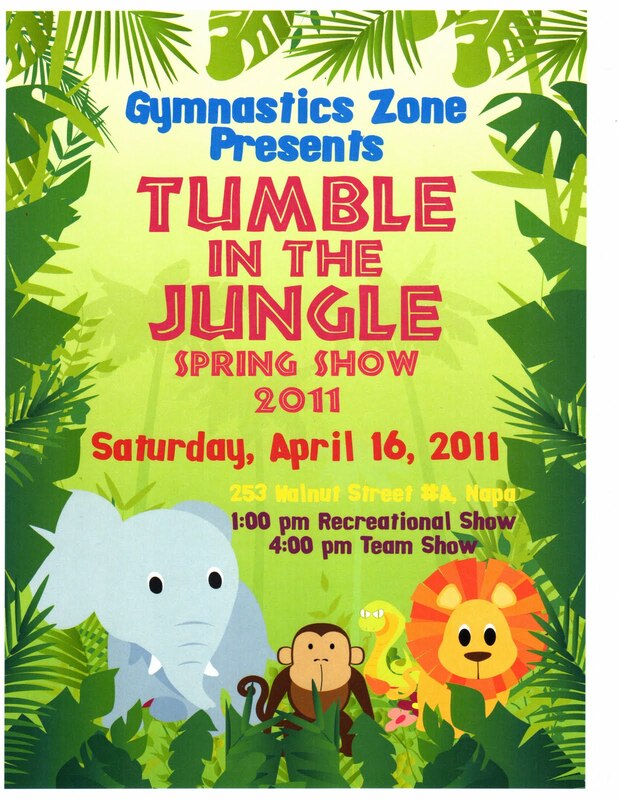 This year’s show, entitled “Tumble in the Jungle” will showcase the talents of gymnastics students from throughout the Napa valley. Boys and girls of all ages have been working hard to prepare new dance and tumbling routines that will demonstrate their skills. Gymnasts will also perform on balance beam, uneven parallel bars, vault, still rings and high bar. Basic recreational classes will perform at 1pm and will include an exhibition floor show from the gym’s competitive team. The Junior Olympic leveled classes and competitive team will showcase their talents at 4pm which will feature an additional exhibition floor show. General admission is $6 per person with a limited number of reserved, upstairs seating also available for $ 15 per seat at the door. Snacks, items for purchase and raffles will be available as a fundraiser from the competitive team during the event.